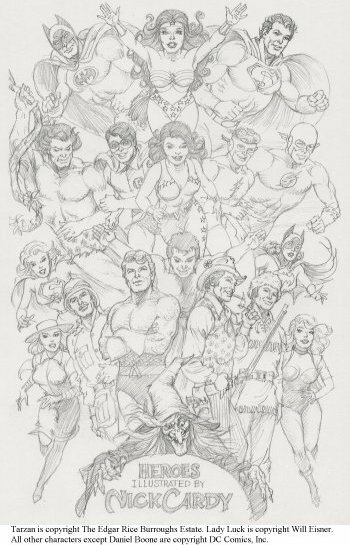 The 1996 Heroes Convention (which occurs traditionally on Father's Day weekend) held June 14 - 16, 1996, marked Nick Cardy's first ever convention appearance. Nick says it's his first convention appearance but I've seen a Cardy autograph that was supposed to be from the 1970's. So let's say that it was Nick's first convention appearance as a guest. And it's definitely Nick's first appearance since leaving comics more than 20 years ago. In the convention book, Nick said, "I was born retired." The back cover of the book featured Teen Titans artwork done especially for the convention. It had the original Teen Titans (pencilled by Nick, inked by George Perez), the New Teen Titans (pencilled and inked by George) and the Titans (DC's newest incarnation, pencilled and inked by Dan Jurgens), all colored by Tom Smith. Nick signed bunches of autographs, sold numerous sketches and basically accepted all his well deserved praise from comics professionals and just plain old fans. Seen for the first time was Nick's painting of the cover to DC's unpublished "Greatest 60's Stories Ever Told". This painting was eventually printed in black and white in Comic Book Marketplace #48 to illustrate the interview with Nick. On Saturday, to the first 500 attendees, the Heroes Convention gave out signed and numbered prints of Nick's drawing of characters he's drawn during his career. This print featured Lady Luck, Tarzan, Daniel Boone and Congo Bill as well has Superman, Batman, Wonder Woman and of course, the Teen Titans and Aquaman. And more characters!!! Nick had a good time personalizing those prints. Click here for a scan of the print. Nick also attended the 1997 Heroes Convention June 13 - 15, 1997. He sat with fan favorite Jose Luis Garcia Lopez. Nick was really impressed with Jose's powerful sketches. Nick was at the 1999 Heroes Convention June 18 - 20, 1999. He sat with Teen Titans collaborator and star in his own right, George Tuska. One night a bunch of convention guests were dining at the Palm. There were already many caricatures and cartoons drawn on the walls. Irwin Hasen added Dondi. Sheldon Moldoff added Batman. Nick added Bat Lash for good measure. In the end, the manager was so knocked out he cancelled the bill!! All characters are © DC Comics, Inc.